Bison Pot Roast – What is it and How to cook it. What is Bison Pot Roast? Pot roast is not a specific cut of meat, it is a method of cooking. Brown the meat, and slow cook the meat using liquids such as beef or chicken stock, coca-cola (makes for a very flavourful and tender roast) wine, beer or water. Pot roast is basically a braise that cooks at a low temperature. Best cuts of meat for pot roast are leaner, cheaper cuts. These are cuts with a lot of connective tissue. Cuts of meat coming from areas that are constantly in motion. The more the animal uses it’s muscles, the more connective tissue is has and the tougher is the meat. These cuts are not good for fast grilling on high temperature like steaks. Chuck – comes from the front portion of the bison. 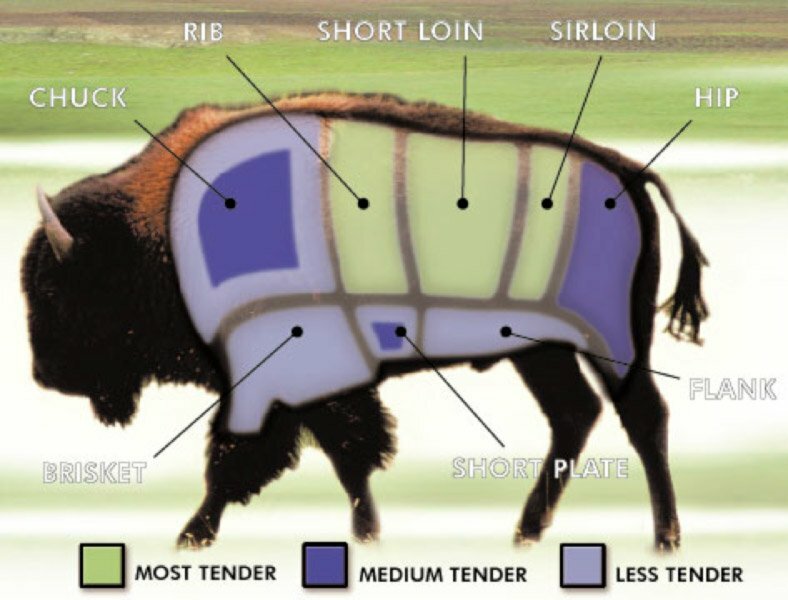 The cuts of bison used for pot roast have less fat than even bison steaks. Long, slow cooking with liquid (braising) is a must. This tenderizes the meat fibers. 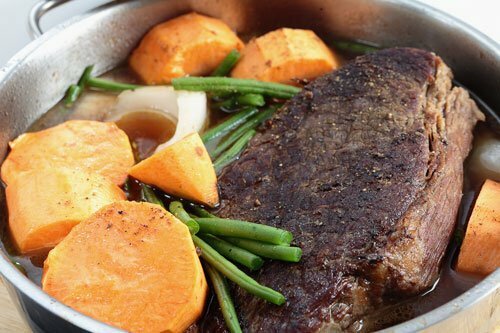 The best way to cook pot roast is in the oven or a crock-pot. First season and brown the meat on all side in a skillet to lock in the juices. This process caramelizes the sugars and proteins in the bison. Not only does it improve flavour but makes the meat a deep delicious brown colour. The long cooking time breaks down the high amount of collagen in tough cuts and tenderizes the meat. These cuts of meat have a lot of natural flavour and it’s really worth the time to cook cook them properly. Add vegetables such as carrots and potatoes may be added right at the beginning in a crock-pot) or about an hour before the meat is done when cooking in the oven. You have yourself a delicious meal without much effort. You will get 2-3 servings out of a pound of boneless roast. And 2 servings from bone-in roast. A healthy serving is 4-6 ounces per person.